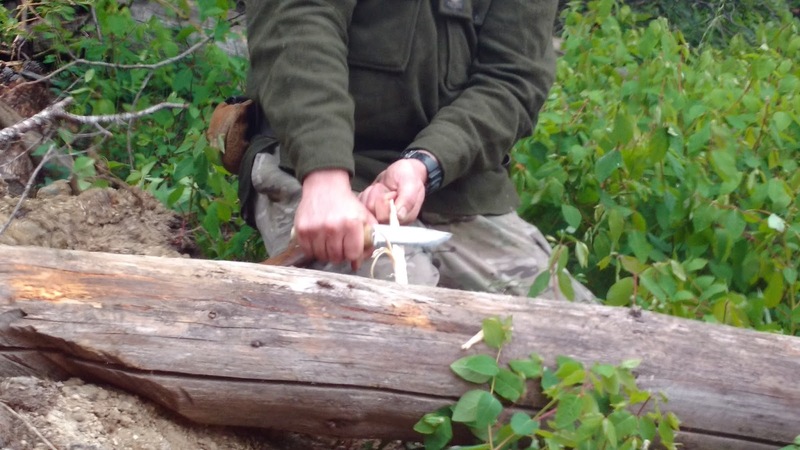 During my stay as an intern at Chilcotin Holidays I had the chance to take part in a bush-craft course. It was given by Nick, an amazingly enthusiastic survival trainer who shared an immense amount of knowledge with us during a very short time. He explained many techniques to us and gave us the chance to try it ourselves. One technique I learned was how to split wood with a knife! To split wood with a knife you need, well, wood and a knife. The knife needs to be a non-folding one, a good knife to split dry and dead wood of about 3 inches in diameter should have a blade about 6 inches long and about one inch wide at the handle. The wood should be no longer than one foot for comfortable handling. You need to choose a safe place with enough light and you should have first aid equipment at hand as well as having another person watching you. So how do you do it? You first hold the lower end of the wood in your left hand like you would hold a torch. While holding it, sit or kneel on the ground and press the wood onto another piece of wood. The other piece, further on what we call the base wood, should be not moving when hit, so you have to choose one big enough. You also need to examine the wood you want to split and see if you can find an ideally long gap. Press the wood to be split on the base wood with the gap facing upwards so you can see it. Hold the wood firm in your hand during the whole procedure. Unsheathe your knife and hold it in your right hand, blade facing down, edge facing away from you. Move the tip of the blade into the middle of the gap with no force. Check again and make sure that the edge of the blade faces away from you. With gentle force, press the tip of the knife into the gap. Lift the wood with the left hand and simultaneously lift the knife with the right hand a few inches from the base wood. With gentle force and momentum, bring both the to be split wood and the knife down until hitting the base wood. This gentle hit drives the blade deeper into the to-be-split wood. Repeat the gentle hits, eventually raising the force and lifting distance within a controllable range. As soon as the tip of the knife has gone through the whole piece of wood, keep holding the wood in your left hand. Now twist the knife 90 degrees to widen the gap and eventually split the wood in two pieces. This technique works for different wood sizes as well as for wood which does not show a visible gap in the beginning. Continuous practice improves the performance. Always be aware of the risks of handling a knife. Keep in mind to face the edge away from your body and do not use much force. It is not necessary. Now you have some wood ready for a fire to cook and to keep warm from, all done by a knife!